NEC2C is a well-known software for calculating frequency-dependent radiation patterns and feedpoint impedances of antennas. The open source software “automatik“, which is a recently published program for Linux, allows the extension of NEC input files with variables for element lengths and distances, which then can automatically be optimized using an evolutionary algorithm. 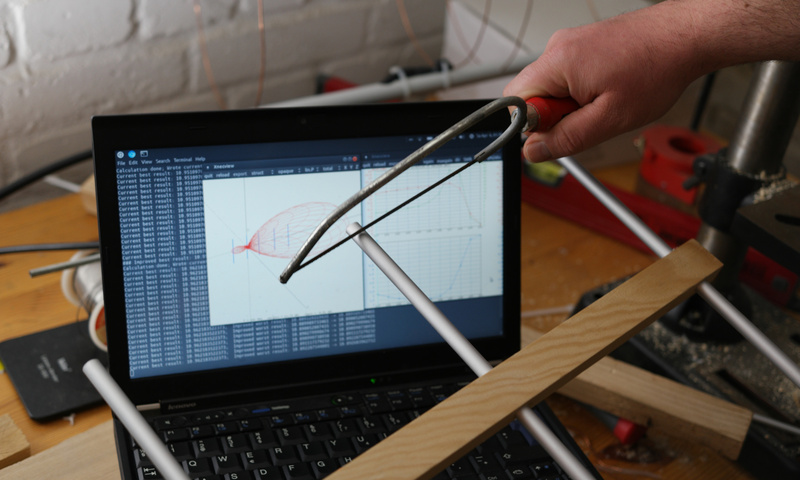 With this toolset, not only yagi-udas but many other optimized antenna designs can be created using one’s own computer. 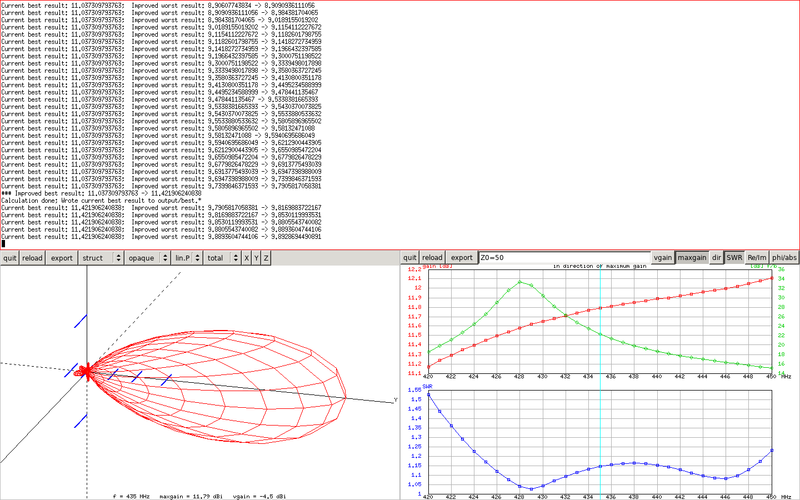 However, usage of both programs requires some training, as the antenna geometry has to be described in a special text file. “automatik” in action: The upper part of the screen shows the text output of the evolutionary optimization; the lower part shows two windows of Xnecview, which displays the current design with radiation pattern as well as the SWR curve. In each generation, an improvement of the design is attempted. The website nec2.org provides a manual for NEC2. The most important commands, which are described there, are: CM, CE, GW, GE, EX, FR, RP, and EN. These commands should appear in every NEC (antenna) description file in that order. Due to the old age of the original NEC software where punched cards were used in computing, the manual doesn’t mention commands but “cards” (e.g. the “CM card”). We can think of these cards as “commands” because in NEC2C, each of those “cards” is simply a line in a text input file. Instructions on using the program “automatik” can be found in the README file of the software package, which can be downloaded here. It also includes two NEC example files (extended with variables for evolutionary optimization), which can be used for testing the program. One of the example files is a yagi-uda antenna for UHF (see also screenshot). The other file contains a full-size (resonant) loop (also for UHF) with reflector and directors (similar to a cubical quad). For other structures or bands, modified or new template files can be created.